Today we at Gecko decided it was definitely soup weather – chilly and bright. 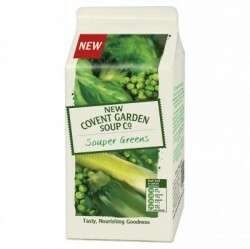 So, we opened a tetra-pack of New Covent Garden Souper Greens soup. It looked truly horrid… but tasted delicious! Consensus in the office – we will be it enjoying again! And, now we want to win a farm! When so many are currently looking for a ‘change of direction’ or to ‘move to the country’ what a fabulous piece of marketing!